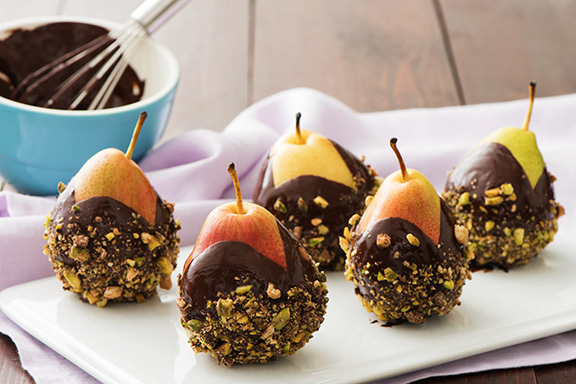 Wrap these pears in cellophane and tie with a bow for an impressive hostess gift. They also make a stunning centerpiece for your holiday table. 1. Line baking sheet with waxed paper; set aside. In heatproof bowl set over saucepan of hot (not boiling) water, melt chopped chocolate with truffles, stirring occasionally, until smooth; keep warm. 4. Sprinkle bottom third of chocolate-coated area with pistachio mixture until evenly coated; place on prepared baking sheet. Refrigerate for about 1 hour or until chocolate is hardened. Tip: If desired, insert skewer into top of pear for dipping.